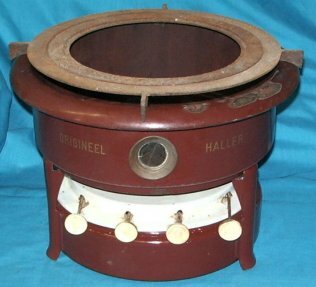 Haller "Origineel" kerosene stoves were originally made by Georg Haller Co of Ottensen (Hamburg), Germany. Haller stoves date from circa 1900, but some variations (clones) were made in the former East Germany and are marked DRG. Production apparently ceased by 1975. 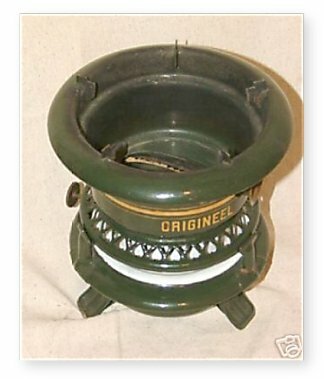 The need for these stoves in the early 1900's was manifest. The Industrial Revolution in Europe was in full vogue, with rural residents being displaced to the cities to find work, so virtually any habitable structure was considered livable even without a kitchen. In those conditions, a Haller stove was indispensable. 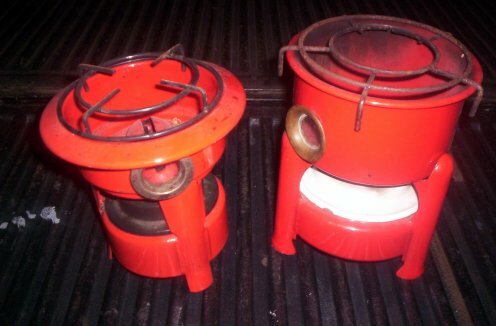 The most common Haller stove encountered is the single wick design, but models with 2, 3 and even 4 wicks were manufactured. All of the variations I have encountered used the same wick, however. 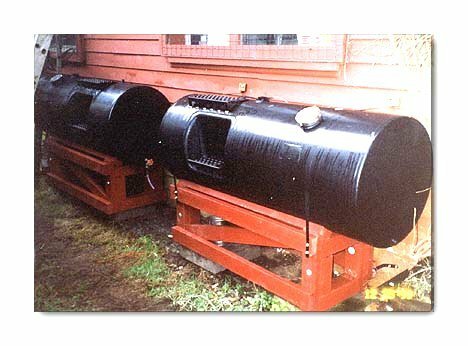 Haller stoves are of enameled steel construction. 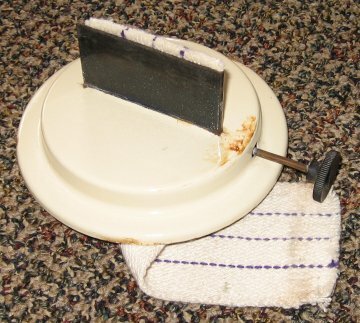 The white area visible at the bottom of the stove is the wick holder, and the venting visible allows a considerable amount of fresh oxygen to feed into the 2 3/4" flat wick. These stoves burn very clean and odor-free providing water clear 1K kerosene is used. 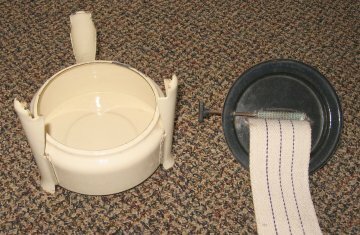 The fuel reservoir is primitive, however, being nothing more than a basin for the wick, and care must be taken to prevent spilling. 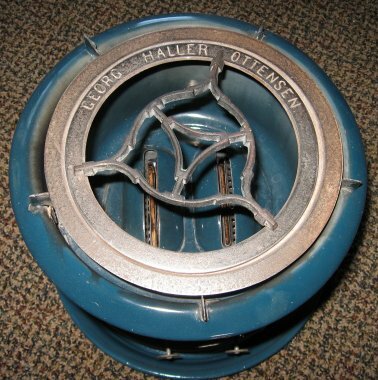 There were at least three grades of Haller stoves. In the photos directly below, the single burner at left is of obvious higher quality than the four stoves on the right. The all-stamped steel 4 burner below right is considerably lighter and made less expensively than my newest 4 burner shown in the bottom photo on this page, with excellent cast iron parts and very heavy, thick metal. A good mid-range stove is the blue Haller below, still stamped steel but heavier and thicker than the cheaper versions at top right. Haller stoves require a thin, 2 3/4" flat wick as they have precision gear wheels and a narrow wick sleeve. Assembly photo #1: At left, the top piece is removed from the base. The pot/pan support has already been removed. The simplicity of the design is readily apparent: Note how easy it is to clean the various parts. And you can see that where the enamel chipped, rust appears. Considering that this stove was in use for decades, however, proves the sturdiness of the basic design. Assembly photo #2: The wick assembly removed from the fuel reservoir. The reservoir is an open bowl, easy to fill and clean, and just as obvious is that care must be taken when in use so that fuel does not spill. In this photo the base has been removed. For cleanliness in storage, the base fits perfectly over the upper heat chamber, above right in photo #1. Assembly photo #3: A new wick has been installed. Because of the tall constricted wick slot, pushing a wick into place through the wick raising gears is extremely difficult. It is vastly easier to pull the wick through from the top. I use a 6" piece of duct tape, with one inch on each side of the wick and the remaining 4" pressed against itself to form a thin wick extension. The duct tape easily slides through the wick slot and the wick is then pulled into place. Note that I bevel the edges of the wick to make it easier to pull through the wick gap in a straight line. 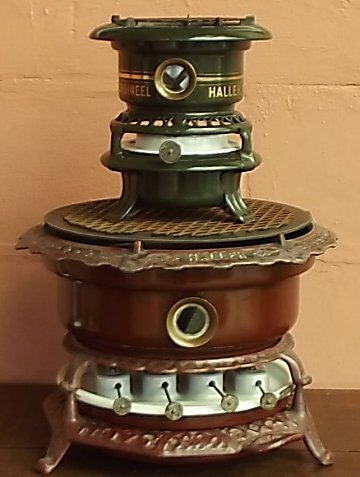 Haller stove, a recent addition to my collection, a two wick model with all the pot/pan support rings intact. 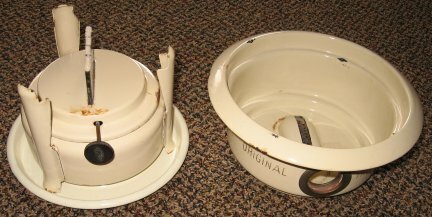 Each ring can be removed to fit the size of the bottom of the pot or pan. The center support is for small pans. The inner ring clearly says Georg Haller, Ottensen. Click photo to enlarge. The photo at left shows the easiest way to install new wicks in a Haller stove. Note the duct tape extensions on the wick. 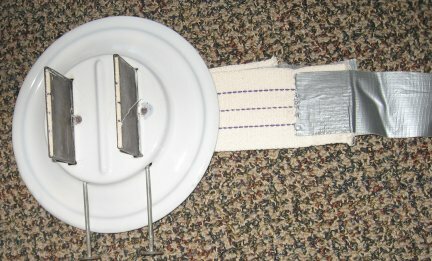 The duct tape is pushed through the wick slots from the top, the wick pulled down level with the top of the wick tubes, then the duct tape can be removed. My latest Haller stove, a four burner, with a pristine single burner on top to illustrate the relative size. This 4 burner was Haller's primo model, more of a range than a pedestrian stove. This grade had three sections of cast iron excluding the burner plates on top, and very heavy gauge enameled steel. The little single burner stove may weigh 2 pounds, but the four burner weighs over 20 pounds! This large, heavy stove was brought to Canada by German immigrants before the Great War of 1914-1917 and kept in the family until finally sold in 2012. 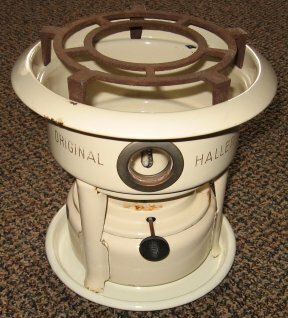 Haller Stoves used 2 3/4" wide, relatively thin wicks. Measurements needed if you have an unlisted heater. WATER IN KEROSENE causing "dwindling" and poor performance. Butterfly A-822, 22 wick, all-aluminum premium stove.